Haiti's general elections of 2000 featured elections for the Chamber of Deputies and the Senate on May 21, as well as a presidential race in November. Although the legislative elections in May had been delayed several times and irregularities were reported on voting day, the balloting was initially judged to be free and fair. However, there was controversy after the election regarding the decision of the Provisional Electoral Council to declare first-round winners in a number of disputed senate seats (rather than hold a second round of run-off elections), leading to allegations of electoral fraud. The president of the Electoral Council, Léon Manus, fled the country before the results of the elections were proclaimed fearing for his life. He later claimed that he was being pressured to declare first-round winners for senate seats he believed needed a second round. The OAS electoral observation mission ultimately released a critical report, which contributed to the U.S. decision to suspend aid to Haiti in 2000. In the presidential elections that followed on November 26, the opposition parties boycotted the election, which partly explains the landslide victory of Jean-Bertrand Aristide. There is a dispute about the nature of the 2000 elections. Some say that the Lavalas party, Aristide and President René Préval were violating democracy (for example, refusing to hold run-offs in the senate, intimidating opponents etc.) while other commentators think that opposition - representatives of Haiti's economic elite - refused to participate in democratic elections since they knew that they would lose them. An article in the New Left Review holds, that the problem the OAS found in the legislative elections would not have had an effect on the results; the OAS itself reached the same conclusion. According to Centre for International Policy the elections were Haiti's best so far. 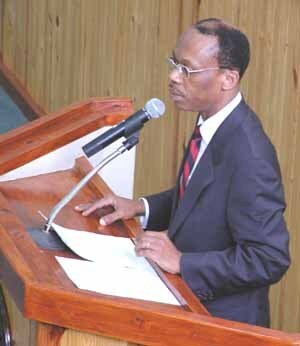 Jean-Bertrand Aristide was elected twice to the presidency of Haiti, in 1990 and in 2000, and was forced into exile mid-term both times, in 1991 and 2004. Born into poverty near Port-Salut, Aristide was educated by Catholic priests of the Salesian Order and, after studying in Haiti and abroad in Rome and Israel, was ordained as a priest in 1983. During the '80s Aristide became a national figure as a defender of the poor against the oppressive policies of the ruling Duvalier family. After the fall of the Duvalier regime in 1986, Aristide became more involved in politics, survived several assassination attempts and was eventually expelled from the Salesian Order for advocating revolution. With popular support and help from the United States, in 1991 Aristide took office as Haiti's first democratically elected president (elected in December of 1990). After he had served just seven months in office, however, a military coup sent him into exile, first in Venezuela and then in the United States.